What’s That Growing Inside the HNRCA? 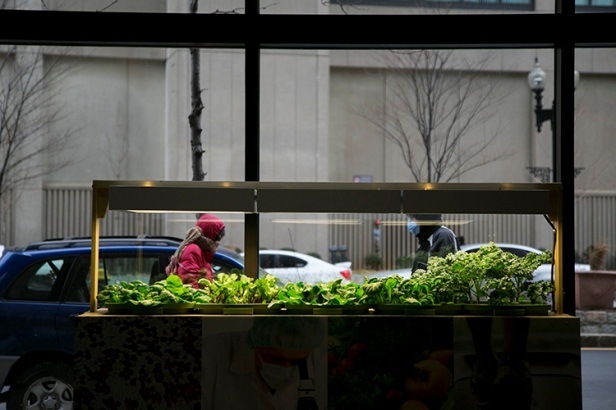 A new indoor gardening project started this year in the lobby of the HNRCA in collaboration with the Massachusetts Horticultural Society’s Garden to Table program. This is the first of its kind for the MA Horticultural Society’s Garden to Table initiative, says project coordinator Lisa Kramer. 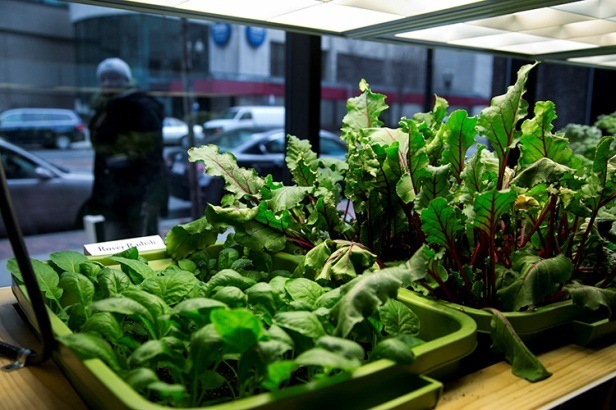 This new indoor garden space is a learning experience for the Garden to Table program. “We hope to build more partnerships with hospitals and research institutions to understand the relationships between horticulture, cooking and science.” The project is an urban extension of previous initiatives by the MA Horticultural Society, that has larger garden in Dover, MA which reportedly grew 4,000 pounds of produce to support Natick and Wellesley food pantries! Special project coordinator John Heine expressed that the garden is a way for the HNRCA to educate, sustain and give back to the surrounding community. The care of the garden is up to the volunteers from the HNRCA. 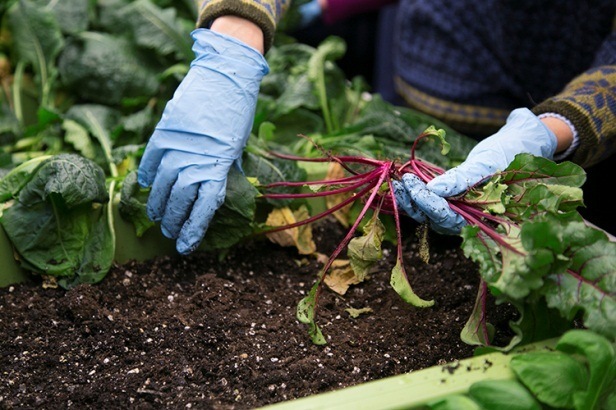 All staff and students in the building are encouraged to work in the garden and help harvest the produce every three weeks. All of the produce grown in the indoor garden is being donated to the St. Francis House in downtown Boston. Currently the garden is growing Vietnamese mint, Rover radishes, Tatsoi (Asian greens), Japanese turnips, red beets and hybrid kale. The garden is only the start of the partnership between these two organizations. HNRCA’s Communications Specialist Deb Dutcher said that a Talk and Taste Public Lecture Series will start on April 5th that features plants that are suitable for Boston’s climate. These lectures will include discussion about a chosen plant, its health benefits and nutrient composition, and how to prepare a dish using it. Dutcher also mentioned that there are educational materials about the new garden posted in the lobby for the building staff, students and study participants to bring more awareness to the project. For more information about the garden project and the Talk and Taste Series, visit the MA Horticulture Society’s website http://www.masshort.org/Garden-to-Table-Program/ or visit the HNRCA’s Facebook page https://www.facebook.com/JMHNRCA. Katherine Wright is a 2nd year Friedman student with an interest in nutrition interventions and health technology. To learn more about her, visit our Meet Our Writers page. Awesome Friedmanites writing Nutrition! Check it out!